Provide comfort for the family of Carol Neff with a meaningful gesture of sympathy. 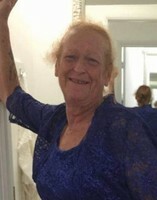 Carol Virginia Neff, 61, of New Martinsville, WV died Thursday, March 28, 2019 at her daughter's home. Carol was born April 19, 1957 in Proctor, WV; daughter of the late Archie and Goldie (Williams) Smith. She was a homemaker, enjoyed making crafts, volunteered with Helping Hands Food Pantry, loved listening to music and member of the Emmanuel Baptist Church. In addition to her parents she was preceded in death by her siblings Ronnie Smith, Gary Smith, Gerald Smith, Norma Smith, Linda Starkey, Kay Carroll and Ruth McLaughlin and a grandson, Aiden Carroll. Surviving are her husband, Russell Neff, Sr.; two sons, Joey (Sherri) Carroll of Friendly, WV and Russell (Jerry Mathers) Neff, Jr. of New Martinsville, WV; two daughters, Cynthia Carroll of New Martinsville, WV and Crystal (Mike Wise) Perine of Sistersville, WV; three brothers, Charles Smith of Middlebourne, WV, Junior Smith of New Martinsville, WV and Anthony Williams of Parkersburg, WV; sister Diane Morgan of Sardis, OH and several grandchildren, great grandchildren, nieces, nephews and cousins. A graveside service will be held at 2 p.m., Sunday, March 31, 2019 at the Palmer Cemetery near Proctor, WV. Family is asking donations, to help with the funeral bill, for the checks to be made payable to Jarvis-Williams Funeral Homes, 1224 S Bridge St., New Martinsville, WV 26155. To send flowers in memory of Carol Virginia Neff (Smith), please visit our Heartfelt Sympathies Store. Provide comfort for the family of Carol Virginia Neff (Smith) by sending flowers. So sorry. Prayers for comfort for Carol's family. Will miss Carol, such a very nice kind lady, who always treated me with kindness, and love, she will be missed by many, RIP dear friend, until we meet again, praying for the family for peace and comfort. May the family of Carol Virginia Neff please accept my sincere condolences hoping you find comfort in God's words at Acts 24 : 15 and Psalm 37 : 29.